حیدری, علی اصغر, علی عباسپور, رحیم. (1397). امدادرسانی زمان‌مند بر اساس جستجوی فراکتال. فصلنامه علمی - پژوهشی مهندسی حمل و نقل, 9(3), 393-411. علی اصغر حیدری; رحیم علی عباسپور. "امدادرسانی زمان‌مند بر اساس جستجوی فراکتال". فصلنامه علمی - پژوهشی مهندسی حمل و نقل, 9, 3, 1397, 393-411. حیدری, علی اصغر, علی عباسپور, رحیم. (1397). 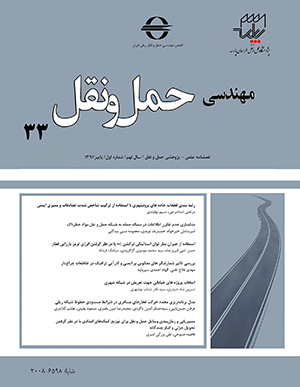 'امدادرسانی زمان‌مند بر اساس جستجوی فراکتال', فصلنامه علمی - پژوهشی مهندسی حمل و نقل, 9(3), pp. 393-411. حیدری, علی اصغر, علی عباسپور, رحیم. امدادرسانی زمان‌مند بر اساس جستجوی فراکتال. فصلنامه علمی - پژوهشی مهندسی حمل و نقل, 1397; 9(3): 393-411. پس از وقوع بحران، آمادگی برایامدادرسانی کارآمدنقشی اساسی در کاهش هزینه‌ها و تلفات انسانی احتمالی حادثه خواهد داشت. امدادرسانی به‌عنوان یکی از مهم‌ترین مراحل توسعه سامانه‌های مدیریت بحران شناخته می‌شود. به منظور توسعه رویکردی کارا برای امدادرسانی زمان‌مند، در این پژوهش به حل مسئله‌ای بر اساس مسئله مسیریابی موجودی با وضعیت چند دوره‌ای و چند کالایی پرداخته شده است. جهت حل مدل، از یک الگوریتم بهبودیافته بر مبنای الگوریتم جستجوی فراکتال بهبودیافته بهره‌گیری شد. جستجوی فراکتال یک الگوریتم بهینه سازی قدرتمند و جمعیت‌مبنا است که بر مبنای تئوری پتانسیل و پدیده رشد فراکتال­ها و سه قانون فیزیکی اولیه به جستجوی فضای مسئله می­پردازد. با در نظر گرفتن مسائل نمونه، کارآیی الگوریتم پیشنهادی در مقایسه با دیگر الگوریتم‌ها از منظر زمان اجرا، سرعت همگرایی، نرخ موفقیت، بهترین و میانگین، انحراف از معیار و برتری آماری نتایج با استفاده از آزمون ویلکاکسون مقایسه شده است. ارزیابی نتایج الگوریتم‌ها نشان­دهنده کارآیی بالای الگوریتم پیشنهادی از منظر زمان اجرا، سرعت همگرایی و نرخ موفقیت به‌منظور مسیریابی زمان­مند در سناریوهای امدادی است. نتایج نشان می­دهد که با افزایش ابعاد مسئله، کارآیی بالاتری در رویکرد پیشنهادی مشاهده می­شود. چارچوب ارائه­شده در این تحقیق می­تواند پاسخگوی نیازهای جاری سناریوهای امدادرسانی و همچنین مسائل مربوط به مسیریابی موجودی باشد. -Andersson, H., Hoff, A., Christiansen, M., Hasle, G. and Løkketangen, A. (2010) "Industrial aspects and literature survey: Combined inventory management and routing." Computers and Operations Research, Vol. 37, No. 9, pp. 1515-1536. -Aziz, N. and Mom, N. (2007) "Genetic algorithm based approach for the multi product multi period inventory routing problem", Paper presented at the 2007 IEEE International Conference on Industrial Engineering and Engineering Management. -Bertazzi, L., Savelsbergh, M. and Speranza, M. G. (2008) "Inventory routing The vehicle routing problem: latest advances and new challenges", Springer, pp. 49-72. -Campbell, A. M. and Hardin, J. R. (2005) "Vehicle minimization for periodic deliveries", European Journal of Operational Research", Vol. 165, No. 3, pp. 668-684. -Chitsaz, M., Divsalar, A. and Vansteenwegen, P. (2016) "A two-phase algorithm for the cyclic inventory routing problem." European Journal of Operational Research, Vol. 254, No. 2, pp. 410-426. -Coelho, L. C., Cordeau, J.-F. and Laporte, G. (2013) "Thirty years of inventory routing." Transportation Science, Vol. 48, No. 1, pp. 1-19. -Dror, M., Ball, M. and Golden, B. (1985) "A computational comparison of algorithms for the inventory routing problem." Annals of Operations Research, Vol. 4, No. 1, pp. 1-23. -Esparcia-Alcazar, A. I., Lluch-Revert, L., Cardos, M., Sharman, K. and Merelo, J. (2007) "Configuring an evolutionary tool for the Inventory and Transportation Problem", Paper presented at the Proceedings of the 9th annual conference on Genetic and evolutionary computation. -Federgruen, A. and Simchi-Levi, D. (1995) "Analysis of vehicle routing and inventory-routing problems", Handbooks in Operations Research and Management Science, Vol. 8, pp. 297-373. -Ghaffarzadeh, N. and Sadeghi, H. (2016) "A new efficient BBO based method for simultaneous placement of inverter-based DG units and capacitors considering harmonic limits", International Journal of Electrical Power and Energy Systems, Vol. 80, pp. 37-45. -Golden, B. L., Raghavan, S. and Wasil, E. A. (2008) "The vehicle routing problem: latest advances and new challenges", Vol. 43, Springer Science and Business Media. -Guo, S.-M., and Yang, C.-C. (2015) "Enhancing differential evolution utilizing eigenvector-based crossover operator", IEEE Transactions on Evolutionary Computation, Vol. 19, No. 1, pp. 31-49. -Hemmati, A., Hvattum, L. M., Christiansen, M. and Laporte, G. (2016) "An iterative two-phase hybrid matheuristic for a multi-product short sea inventory-routing problem", European Journal of Operational Research, Vol. 252, No. 3, pp. 775-788. -Heidari, A. A., Abbaspour, R. A., & Jordehi, A. R. (2017). "An efficient chaotic water cycle algorithm for optimization tasks", Neural Computing and Applications, Vol. 28, No. 1, pp. 57-85. -Heidari, A. A., & Pahlavani, P. (2017). "An efficient modified grey wolf optimizer with Lévy flight for optimization tasks", Applied Soft Computing, Vol. 60, pp. 115-134. -Hossein Mirzaei, A., Nakhai Kamalabadi, I. and Zegordi, S. H. (2012) "A new algorithm for solving the inventory routing problem with direct shipment." Journal of Production and Operations Management, Vol. 2, No. 1, pp. 1-28. -Lenstra, J. K. and Kan, A. (1981) "Complexity of vehicle routing and scheduling problems", Networks, Vol. 11, No. 2, pp. 221-227. -Li, J., Chen, H. and Chu, F. (2010) "Performance evaluation of distribution strategies for the inventory routing problem", European Journal of Operational Research, Vol. 202, No. 2, pp. 412-419. -Lin, C., Choy, K. L., Ho, G. T., Chung, S. and Lam, H. (2014) "Survey of green vehicle routing problem: past and future trends", Expert Systems with Applications, Vol. 41, No. 4, pp. 1118-1138. -Liu, B. and Jin, N. (2015) "An application of lingo software to solve dynamic programming problem in the field of environmental protection", Paper presented at the 2015 IEEE Advanced Information Technology, Electronic and Automation Control Conference (IAEAC). -Mirzapour Al-e-hashem, S. and Rekik, Y. (2014) "Multi-product multi-period Inventory Routing Problem with a transshipment option: A green approach", International Journal of Production Economics, Vol. 157, pp. 80-88. -Moin, N. H., Salhi, S. and Aziz, N. (2011) "An efficient hybrid genetic algorithm for the multi-product multi-period inventory routing problem", International Journal of Production Economics, Vol. 133, No. 1, pp. 334-343. -Pan, Z., Tang, J. and Fung, R. Y. (2009) "Synchronization of inventory and transportation under flexible vehicle constraint: A heuristics approach using sliding windows and hierarchical tree structure", European Journal of Operational Research, Vol. 192, No. 3, pp. 824-836. -Park, Y.-B., Yoo, J.-S. and Park, H.-S. (2016) "A genetic algorithm for the vendor-managed inventory routing problem with lost sales", Expert Systems with Applications, Vol. 53, pp. 149-159. -Qin, Q., Cheng, S., Zhang, Q., Wei, Y. and Shi, Y. (2015) "Multiple strategies based orthogonal design particle swarm optimizer for numerical optimization", Computers and Operations Research, Vol. 60, pp. 91-110. -Reeves, C. R. (1995) "A genetic algorithm for flowshop sequencing", Computers and Operations Research, Vol. 22, No. 1, pp. 5-13. -Roldán, R. F., Basagoiti, R. and Coelho, L. C. (2016) "Robustness of inventory replenishment and customer selection policies for the dynamic and stochastic inventory-routing problem", Computers and Operations Research, Vol. 74, pp. 14-20. -Salimi, H. (2015) "Stochastic fractal search: a powerful metaheuristic algorithm", Knowledge-Based Systems, Vol. 75, pp. 1-18. -Soysal, M., Bloemhof-Ruwaard, J. M., Haijema, R. and van der Vorst, J. G. (2016) "Modeling a green inventory routing problem for perishable products with horizontal collaboration", Computers and Operations Research, http://dx.doi.org/10.1016/j.cor.2016.02.003. -Van Anholt, R. G., Coelho, L. C., Laporte, G. and Vis, I. F. (2016) "An inventory-routing problem with pickups and deliveries arising in the replenishment of automated teller machines", Transportation Science, Vol. 50, No. 3, pp. 1077-1091. -Zachariadis, E. E., Tarantilis, C. D. and Kiranoudis, C. T. (2009) "An integrated local search method for inventory and routing decisions", Expert Systems with Applications, Vol. 36, No. 7, pp. 10239-10248. -Zhao, Q.-H., Chen, S. and Zang, C.-X. (2008) "Model and algorithm for inventory/routing decision in a three-echelon logistics system", European Journal of Operational Research, Vol. 191, No. 3, pp. 623-635. -Zheng, Y.-J., Chen, S.-Y. and Ling, H.-F. (2015) "Evolutionary optimization for disaster relief operations: a survey", Applied Soft Computing, Vol. 27, pp. 553-566. -Zheng, Y.-J. and Ling, H.-F. (2013) "Emergency transportation planning in disaster relief supply chain management: a cooperative fuzzy optimization approach", Soft Computing, Vol. 17, No. 7, pp. 1301-1314.